Review: The latest version of the Foundry's popular tool is a gift for compositors. 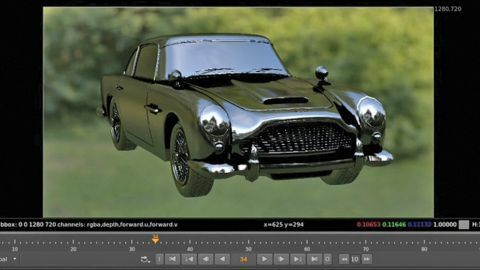 Bugs aside, Nuke 10 is a more efficient and reliable tool providing the sort of features compositors have been waiting for. The Foundry has released its latest revision of its much-anticipated, professional compositing software Nuke. With it come some improvements, as well as some new 3d art tools to get us to our final image quicker. For this review, I looked at Nuke and NukeX. as much when doing paint work within the program. You’ll no longer have to save after every paint stroke on the chance that your script may crash! The third big feature is the new Smart Paint tool. The node uses motion vectors in order to track the place of a pixel on the screen and then warps an image to that movement, causing it to stick to the object you’ve chosen. For instance, if you wanted to paint out some seams on a piece of prosthetic work on someone’s face, you could do your paint work and have it track to the face. The motion vectors contain the movement for each pixel for the next frame. For instance, say on the next frame your pixel moves 10 pixels to the left and 20 up, your value will be -10 in red and 20 in green. This process is slow, however, mainly due to the fact that your motion vectors are calculated live, with no option to precomp values out and read them back in. Hopefully this will be something that The Foundry introduce in future iterations of this version. As with every new version of software there will be bugs at first, discovered as the software is pushed, however, there’s no doubt the latest version improves efficiency when working; allowing an artist to get closer to their look quicker, and the Smart Paint tool is a seriously useful bit of kit to be able to rely on. This review was originally published in 3D World magazine issue 209. Buy it here.